My mother’s family is from the southwest. As a child, she frequently made dinners for us that represented that influence. I developed a love for Tex-Mex and Mexican food at a young age. When I found out Guy Fieri had a Mexican restaurant inside Harrah’s Laughlin, I had to check it out. The shiny modern corner of the otherwise dingy casino, el Burro Borracho is fresh and inviting. Popping with color and artwork on every surface, the atmosphere is as delectable as the food. Upon sitting, we were informed that the giant piece of extraordinary artwork on the ceiling above us (yes, I said every surface) was a replica of the tattoo on Guy’s arm memorializing his sister. Like any good Mexican food restaurant, fresh salsa and chips were brought immediately to our table. Being a vegetarian, I personally did not want the first batch, as it was topped with freshly fried chicharrónes. After just a quick word with the server, we were brought new chips sans pork. From the menu, over half of the appetizers and all of the salads are vegetarian, but meat eaters will note that you can add meat to most of them. It is Guy's restaurant after all. Knowing that we were going to be ordering dessert (I will get to that), my husband and I decided to split a salad and an entrée. That was the right decision. 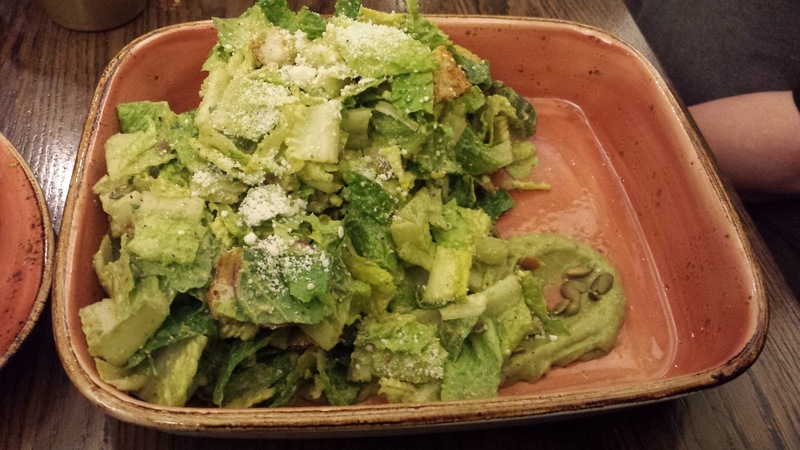 The El Caesar salad was a heaping pile of crisp romaine lettuce dotted with creamy cotija cheese. Fire roasted poblano pepper strips (tasty, but maybe a little too big), crunchy pepitas, fresh radish slices, and chile-lime bolillo croutons (swoon) rounded out the dish. Then the salad was all melded together with a luscious avocado crema Caesar dressing. I am not lying when I say I could eat this salad every day or drink that dressing by itself. Our entrée course was the opposite of salad, Queso Casero Enchiladas. 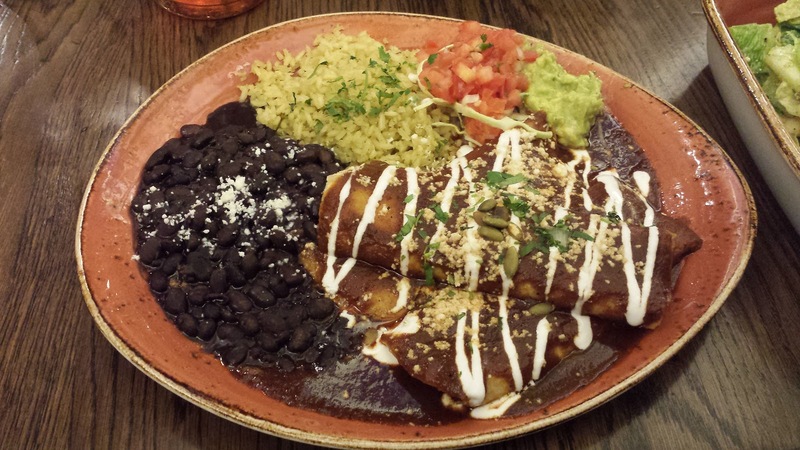 This vegetarian dinner features triple melty cheese wrapped in tender tortillas and smothered in a rich and flavorful borracho sauce. Topped with chopped onions, cilantro and tequila lime crema and served alongside black beans, cilantro rice so yummy I wanted to order another side of it (which you can do by the way), guacamole and fresh pico de gallo. There are plenty of options for the carnivore and a couple more for the plant-based eaters like myself. Next time I want to try the Acapulco Gold salad or the Verduras Asadas street tacos. The star of the night, however, would be dessert. 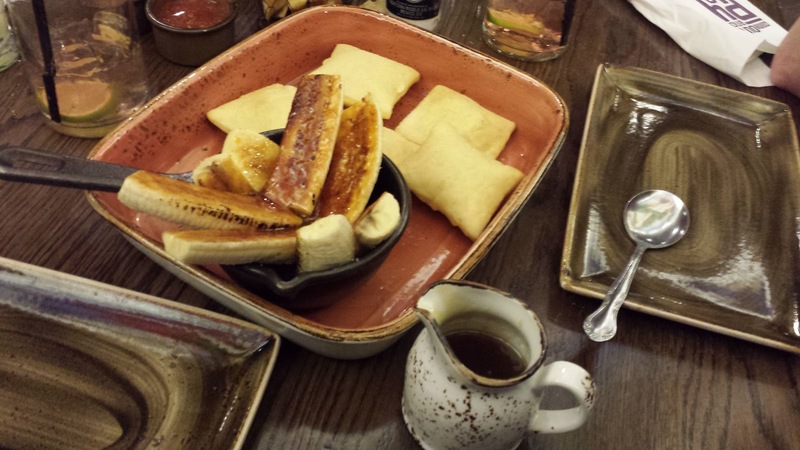 Three words: Borracho Banana Sopapillas. Warm and fluffy house made sopapillas served along side hot caramelized bananas and a syrup pitcher full of liquid heaven, I mean salted caramel. Even though I was stuffed silly, I kept dipping my fork into the syrup pitcher until we left the table and seriously considered asking for a to-go cup.